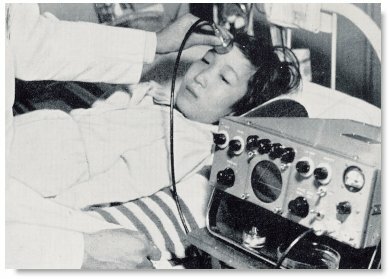 A-Mode scanning of brain diseases at the Medical Ultrasonic Research Center, Juntendo University in Toyko, Japan in the late 1950s and early 1960s. A-mode sonogram of a brain tumor at the right frontal lobe. 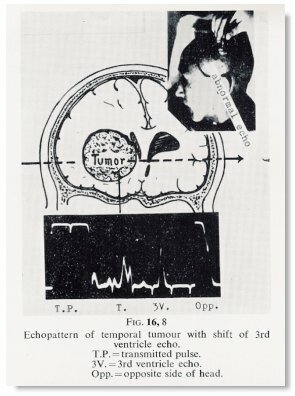 A- mode pattern of a temporal tumor with shift of the third ventricle. 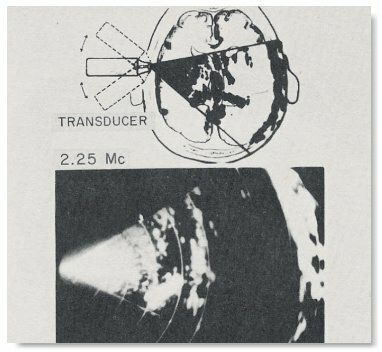 contact sector B-mode scanning for brain tumors at the Medical Ultrasonic Research Center, Juntendo University in Toyko, Japan in the early 1960s. Seen here is Dr. Toshio Wagai performing the scan. Sonogram of the normal head by contact sector scan using a rocking movement. 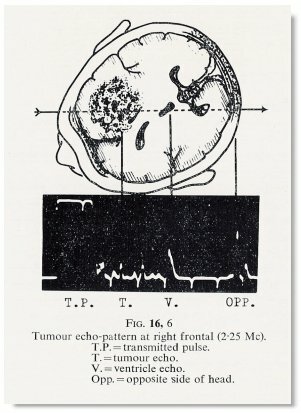 This was the "one-point contact-sector scanning tomography" using the plan-position indication (PPI) B-mode format described by Yoshimitsu Kikuchi in 1957. It has a similar resemblance to the 'Radar screen'. 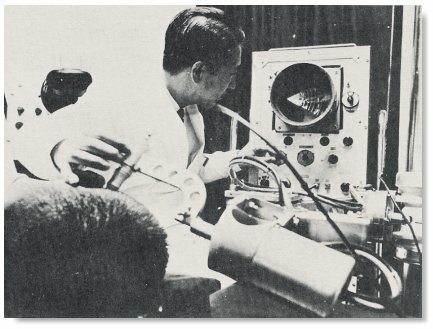 "Ultrasonic Diagnosis in Japan" by Kenji Tanaka, Toshio Wagai, Yoshimitsu Kikuchi, Rokuro Uchida and Sumio Uematsu. In the Proceedings of the First International Conference on Diagnostic Ultrasound held in Pittsburg, Pennsylvania in 1965.